Inspired by Leonardo da Vinci click image below for more info. Today’s #FolkloreThursday is all about the Gods. There are so many wonderful stories involving the Gods in myths and legends but Leda and the Swan is one of my favourites. Leda was a mere mortal, seduced by the God Zeus whilst he was in the form of a majestic swan; she is said to have laid two eggs from which were born four children. In the first egg came the children of Zeus they were Helen (who famously became known as Helen of Troy), and Pollux. In the second egg were the children of Leda’s mortal husband Tyndareus King of Sparta these children were Clytemnestra, and Castor. The boys were often known as the Dioscuri twins who became Demi-Gods. It was after Castor died that Pollux asked Zeus if he could share his immortality with his twin, they were transformed into the constellation Gemini. For more info click HERE. I love this story because it all links in with Helen of Troy and so many other wonderful heroes and legends, some of which are mentioned in my book below. This is a short heartfelt story that includes an A~Z of Herbal Remedies but you can also find a few myths and legends in there about the plants. One such plant is Elecampane ~ Inula Helenium (Helen’s Tears) Click HERE to peek inside the book on amazon or click the image below to read the story right here on the blog (Opens in a new tab). I hope you enjoyed this post, thank you so much for visiting. Today’s theme for #FolkloreThursday is the sea. 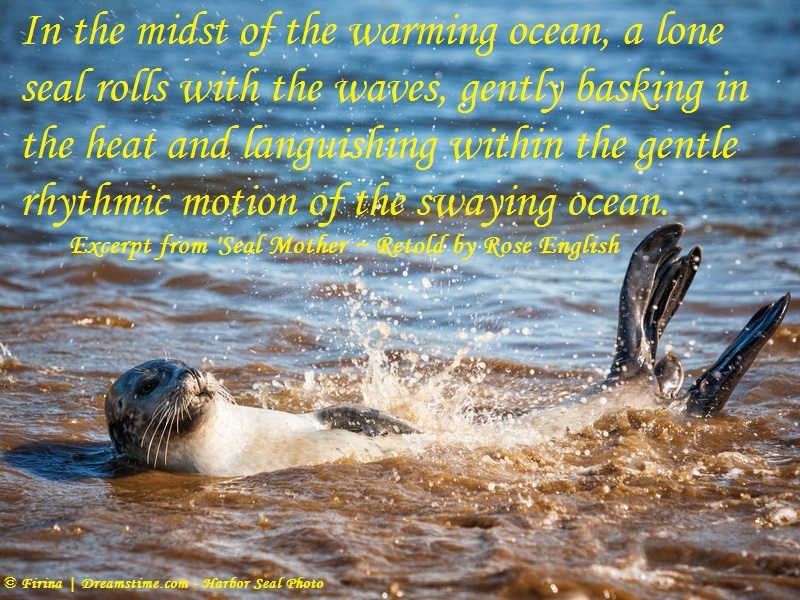 My most favourite stories of all are those of the Selkie Folk ~ Seals who are able to shed their skin and walk in human form at certain times of the year. The most popular time being Midsummer. 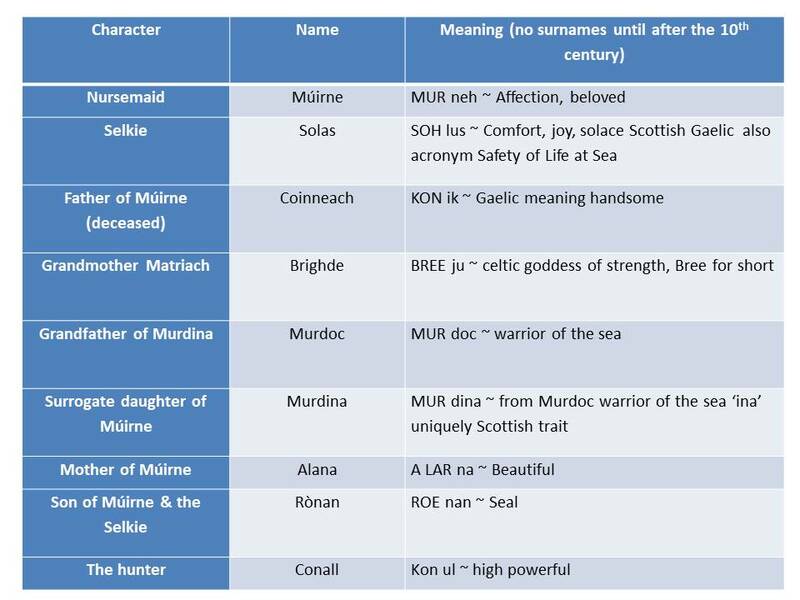 Selkie comes from the Scottish Orkney Islands meaning seal. I thought this little folktale finished, yet I find myself expanding the book. 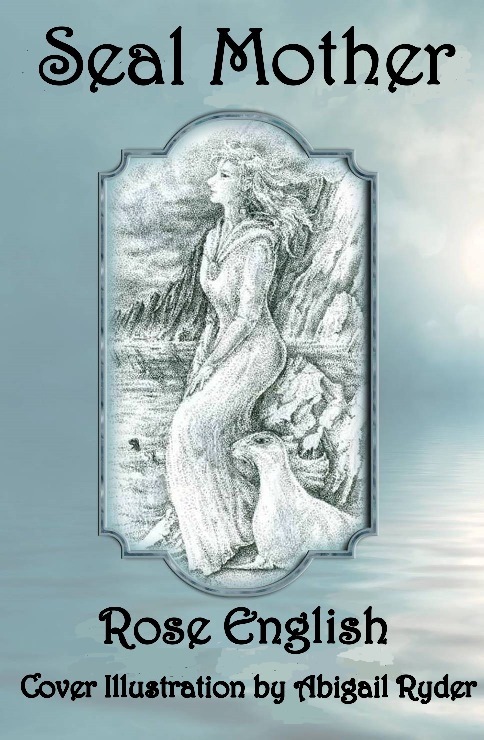 I have done this by adding a further story this time of a handsome selkie male. This is an old folktale from the Shetland Isles check the tune below on the video. Yet the jury is out as I am still unsure which way I want to take this little book. Here now follows a small teaser of ‘Seal Mother’ followed by my own little video from YouTube. Click the image to enlarge. I do hope you enjoyed these little treats, I would love to read your thoughts please do drop me a line in the comments below. Today is International Women’s Day celebrating women around the world. So for #FolkloreThursday I am sharing my story of ‘Helen of the Fields’. She was quite a woman, although many only know her for the cause of the Trojan War. However, she was so much more. It is believed that the medicinal plant Elecampane grew from the tears of Helen and is sometimes known as ‘Helen of the Fields’. This story of the plant and my version of Helen’s tale of woe feature in ‘Lost Love in Spring’ by Rose English. Click the image to enlarge. On the edge of the dry dusty field, below the shade of stately trees, strolls the most beautiful woman in the world. Glistening tears fill soft blue eyes, which slowly spill over the lids leaving a silver trail of moisture on the smooth flawless skin. As each teardrop falls upon the fertile earth, a flower grows up in its place. The golden petals of Elecampane are Helen’s favourite, and resemble the rays of the sun. They evoke mixed memories some good, of her distant happy days of childhood spent with her siblings. As well as some sad, when she was stolen from her family. The locals call the flowers ‘Helen of the Field’ after their Queen who wanders the countryside as if lost and alone. How can this be, you may well wonder? The fact is that Helen is no ordinary woman; she is the daughter of Zeus the King of the Gods. Helen was destined to be a true beauty from birth. She was conceived after the liaison of her mother Leda with the God Zeus, who had disguised himself as a majestic swan. The union led to a quartet of egg born siblings. Helen and her brother Pollux emerged from the first egg, then brother Castor and sister Clytemnestra from a second egg. Some believe that the mortal father Tyndareaus must have guessed at the indiscretion of his wife, yet still he loved his children particularly Helen. Suitors came from far and wide to compete for the hand of the fairest maiden in the land, although some sent messengers, not even attempting to make the journey to Sparta themselves. Because Helen was a rare prize Tyndareaus had all suitors swear an oath, should the princess be abducted, (as she had been previously) then they were to provide military assistance to retrieve her. The distinguished noble men and officers all agreed. Helen had little, if any, say in choosing her second husband; Menelaus was chosen by her father, because of his political status, wealth and power. Agamemnon, his brother, was already married to Helen’s sister. The two families became very powerful, a force to be reckoned with. Helen had no love for Menelaus; she was silently heartbroken that her father had not selected a more handsome man, out of the forty or so heroic and wealthy heirs whom he had entertained in their home. However, she was thankful to her brothers and glad to be back amongst her kin, and was very eager to please Tyndareaus. Menelaus was a power to contend with, and when he became King of Sparta, Helen his Queen was loved by all. She put on a brave face yet was as before, when abducted by Theseus, she often became sorrowful. Not long into her marriage Helen fell pregnant and was confined to her rooms, whilst her new husband surrounded himself with rich, powerful friends. He flaunted his wealth and power showing the whole of Sparta exactly who he was. Even staff in his household was numerous, counting amongst them many exotic servants. It was known by all, that he sired two sons by different concubines. In the palace of King Menelaus, Helen had given birth to a daughter. However, the King once again wanted to show his power and hired the best nursemaids and staff to care for the baby, so Helen rarely saw her child. To escape the overwhelming presence of the slaves within the palace, she spent her time wandering the surrounding fields. When no one was around she allowed her sorrow to spill over. 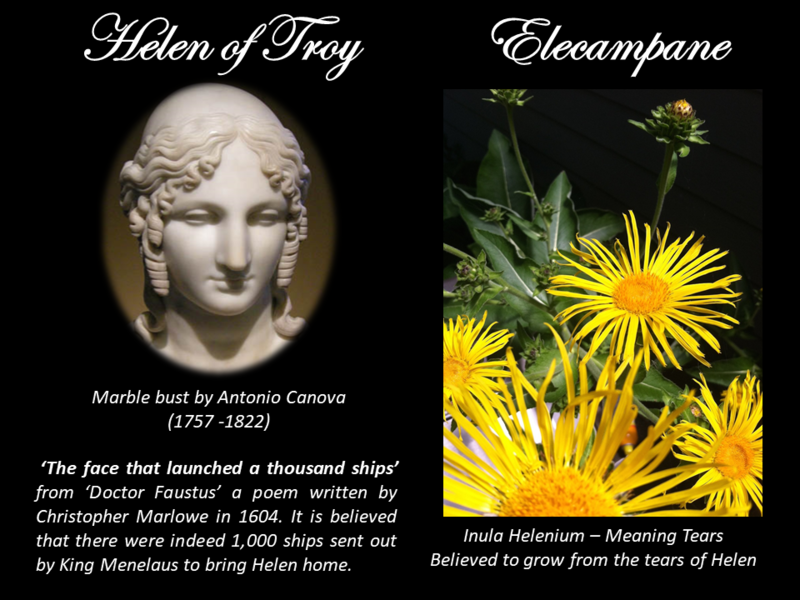 Being the daughter of the King of Gods, Helen’s tears brought forth her beloved flowers, Elecampane. She studied these plants and one day, by chance discovered that the roots had medicinal virtues. 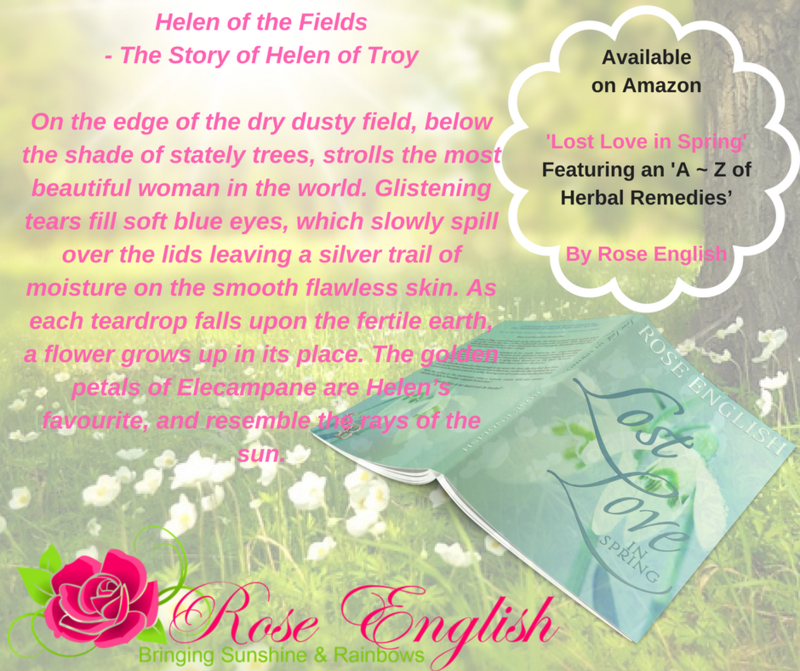 An exceptionally large root was peeking through the fertile soil; Helen knelt down to take a closer look and with her delicate hands she pulled the root up. Curious to see what its structure was like inside she cut the root in half, finding it to be moist and juicy. Lost in her thoughts she was surprised to hear a child’s cry nearby. With hands covered in the essence of the root she turned to discover a young boy sitting at the edge of the field nursing his hand. He had been stung by a bee whilst collecting a flower to take home to his mother. Helen took hold of the child’s hand and the residue of the elecampane root smeared over the wound. His cries died down and he told Helen that the pain had gone. She learned over time the different benefits of using the root to heal. At last Helen felt she had a purpose. When the plague arrived she used the root to help reduce the fever of patients who had succumbed to the disease. The fluids were of great help in drying out the pestilent pustules. During this time the King was told by the Oracle to go to Troy to observe a ritual. 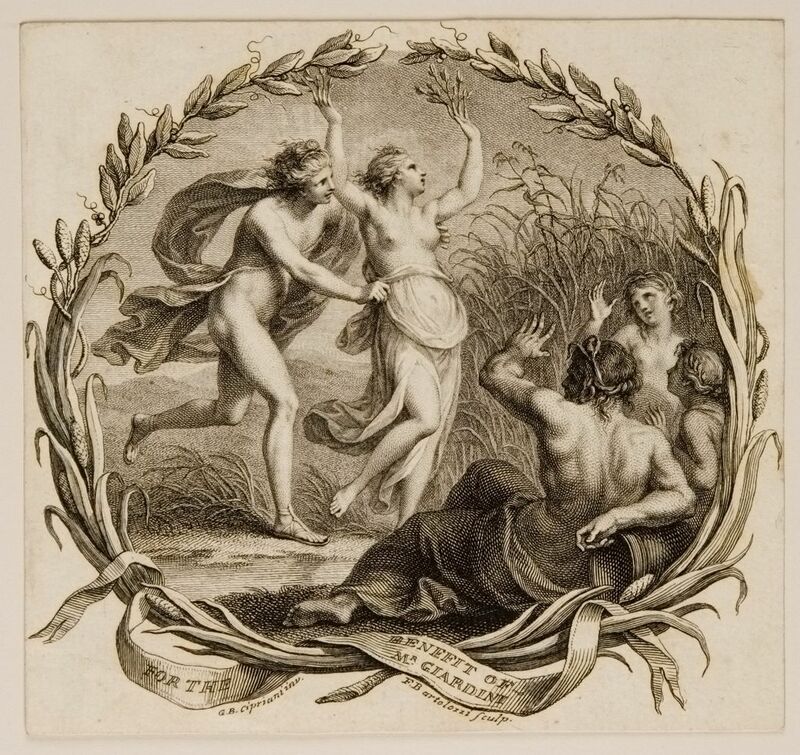 Whilst Menelaus was there he met Paris, who had had to leave his home country and seek purification, after accidentally killing his friend in a sporting accident. The King invited Paris to his homeland of Sparta, giving Paris his opportunity to fulfil the prophecy from Aphrodite of meeting his future wife. Menelaus was keen to show the Prince how royalty lived and entertained in Sparta, so he invited him to stay in the palace. Although he was a prince by birth, Paris had been brought up in a humble home; riches were of no importance to him. When Paris set his eyes upon Helen, he knew he had found his promised love. He was shocked to learn that she was the Queen of Sparta and wife to Menelaus but his ardour could not be dampened. The Prince had many opportunities to see Helen and be in her company, as the King had requested that she entertain their guest. Paris was already handsome, but Aphrodite had bestowed upon him irresistibility, she also sent cupid along to shoot Helen with one of his arrows of love. Soon Helen was also besotted; Paris was unlike any she had met for he was not only handsome but humble. They fell in love but remained chaste, with Paris believing it indecorous to violate the host’s hospitality by sleeping with his wife in the home into which he had been most graciously welcomed. During the time Menelaus was in Crete for the funeral of his grandfather, Paris asked Helen to leave with him. It was an easy decision to make. Paris had his own ship, so the pair left Sparta immediately. Upon reaching the Port of Gythium, Paris dedicated a sanctuary to Aphrodite to thank her for the assistance she had given him. When Paris and Helen arrived back in Troy a great feast was prepared, and the beautiful couple were wed. Consummating the marriage must have been pure bliss for Helen as she had only previously lain with aged men, Theseus and then her husband Menelaus. Helen’s destiny intertwined Troy’s; it was as though she had married the city and its entire population. The couple savoured the joy of each other’s company. Meanwhile back in Sparta, Menelaus had returned to find his wife gone, said to have been abducted by his so called guest Paris. Some of his treasure was also missing believed stolen by the Trojan. The King now called upon all of the suitors who had competed for Helen’s hand and asked them to honour their oath, given to Helen’s father Tyndareaus. They all willingly accepted. One thousand ships were launched, setting sail for Troy in order to bring back their Queen, and the stolen treasures of Sparta. This was the beginning of the Trojan War said to last ten years. Alone, Helen was unsure where to go. Believing she had a friend in Rhodes she eventually made her way there. Polyxo did offer Helen refuge, but turned traitor in revenge for the death of her husband in the Trojan War. As the daughter of Zeus, Helen was snatched away from the brink of death. She was after all an immortalised human. Helen was taken to live with others of her kind, upon the Elysian Fields and the Isles of the Blessed. Stories tell of her being reunited with Menelaus who was also elevated to a status of immortalised human. Spartans built a temple to the old King and Queen, offering up sacrifices and worshipping them as Gods. Helen was also said to have been reunited with her brothers, and together they were sometimes seen upon the earth usually to make something happen or prevent an act. They are mainly known for acting as saviours to sailors. Ancient poets and scribes would also have us believe that in the afterlife Helen became the wife of Achilles, the most beautiful and the most heroic joined together as one. They were alleged to have lived on the White Island, a place akin to the Elysian Fields, the beloved home of the immortalised Achilles. Ultimately, Helen had been an instrument of ‘justice’, her father Zeus used her and Paris as pawns to reduce the human population on earth. When her work was finally done he called her to him, and she lived by her father’s side as a Goddess. Helen became known as the protector of adolescent girls and young married women. She leaves behind her legacy of ‘Helen of the Field’, Elecampane, the healing Inula Helenium, or wild sunflowers that grew from her many tears. An Arabic tale tells the story of the Prophet Mohammed. Mohammed returned home weary and battle worn. 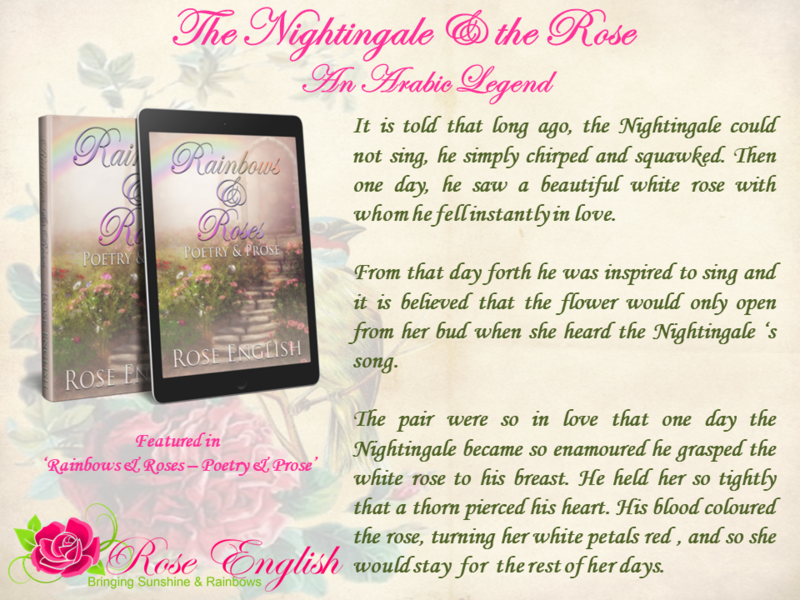 Aisha approached him with a large bunch of red roses eager to welcome him. She was surprised when he asked her to drop the flowers into the river. As they both looked on, each rose turned to saffron yellow as its petals touched the water, indicating her unfaithfulness. However, because he loved his wife so much he forgave her, but the yellow rose still to this day, is a symbol of infidelity. 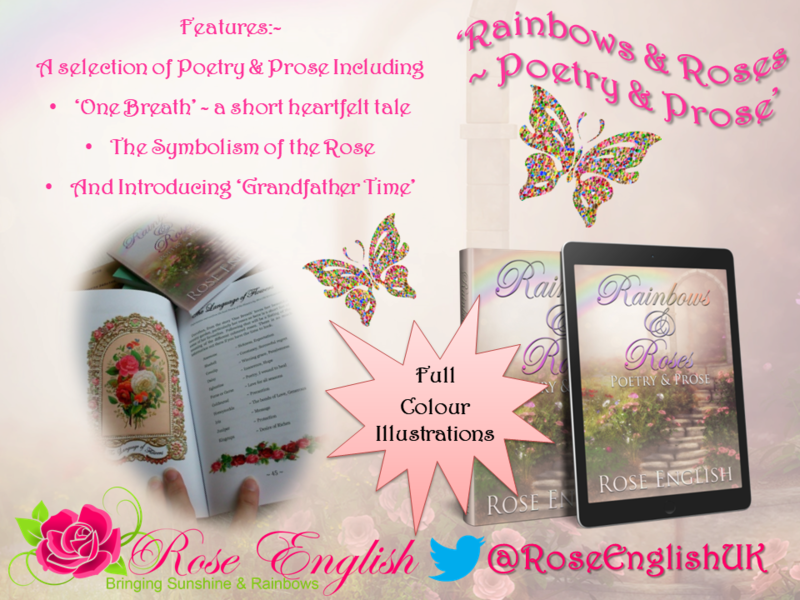 ‘Rainbows and Roses’ is a delightful selection of whimsical short stories, along with a collection of poetry inspired by memories from childhood, the environment, together with a little bit of fun. This week I came across #FolkloreThursday and the theme was Trees, I love trees with a passion almost as much as I love roses. So it gave me an opportunity to get out my research books and check out a few things. My favourite findings are more concerned with Greek Myths than folklore but I want to share anyway. The Metamorphoses of Ovid (Translation by Allen Mandelbaum) is one of my all time favourite research books. As the cover of the book states, it is a ‘treasury of classical myths’. Written by the Roman Poet Ovid (43 B.C. – A.D.17) there are many different translations and even free versions online if you care to browse but Mandelbaum is my favourite. 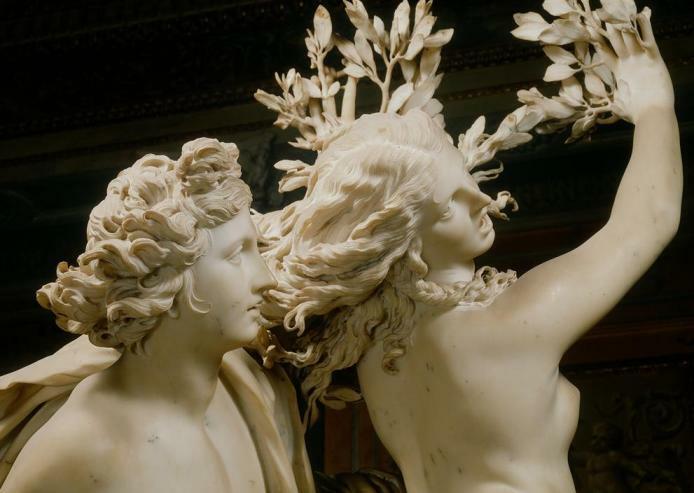 The story I want to share is that of Apollo and Daphne and as you can see from the top image artists have recreated this story in so many wonderful ways. These are my favourites. 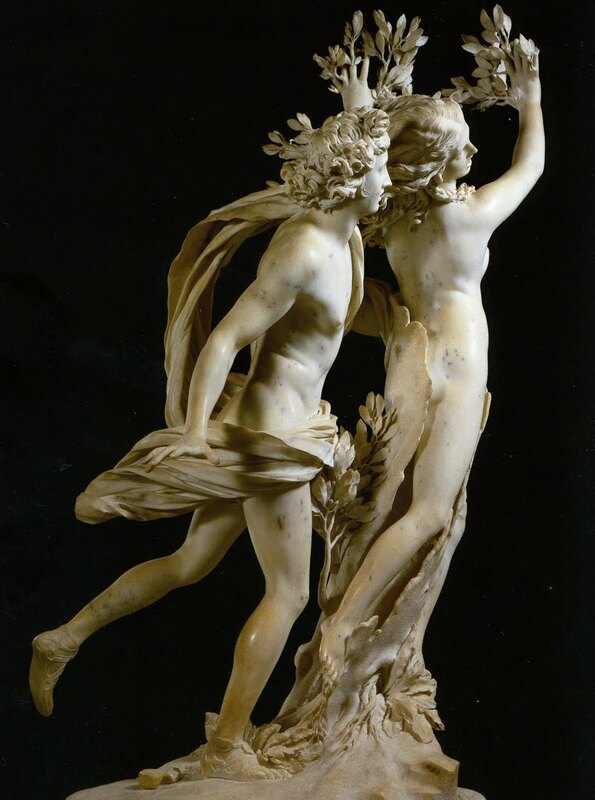 The section of the poem I am sharing is the pursuit of the beautiful Daphne, (daughter of the River God Peneus) by Apollo. He had previously mocked Cupid who shot him with a golden arrow which made him desire Daphne. She in turn was shot with an arrow of lead and thus filling her with hatred for Apollo. He’s faster – and his pace will not relent. Upon the hair that streams down to her neck. of Daphne is her radiance. you cannot be my wife, you’ll be my tree. to wreathe my hair, my lyre, and my quiver. 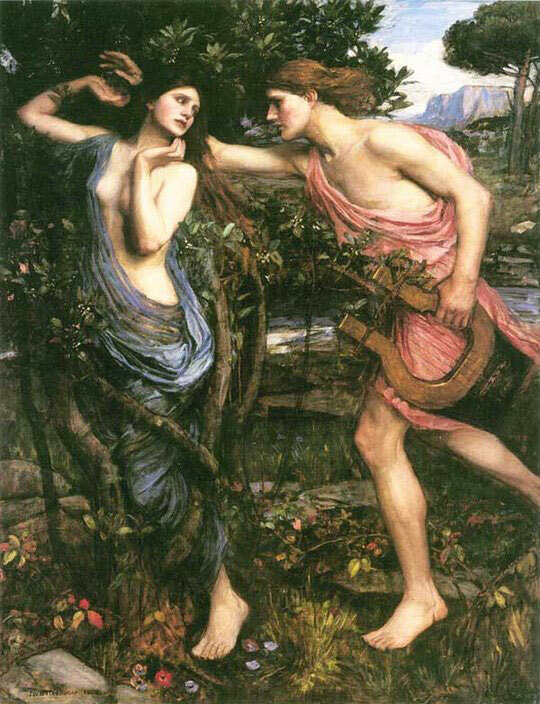 In my eyes I think the painting below APOLLO PURSUING DAPHNE by John William Waterhouse 1908 has got to be one of the prettiest, after the sculpture of course. I hope you enjoyed this little insight into Greek Mythology? I would love to know your thoughts, do you prefer the sculpture or the painting?